Beast Morphers: "Hangar Heist" is episode 6, and it's a pretty close adaptation of the plot and character arcs of Go-Busters episode 6, with the main addition of the model-rocket subplot to set up the Devon/Ravi tension and give Ben & Betty something silly to do, plus the location change to a remote hangar and the involvement of all three main villains. It works pretty well; even though the Red/Blue conflict is adapted from GB, it fits Devon's and Ravi's established characters perfectly. The robot head Scrozzle stole is the partial head of Beet J. Stag, the BuddyRoid partner of the fourth Go-Buster and himself the fifth Go-Buster. Looks like they're going to introduce his counterpart as an evil robot before he switches sides, even though the original character was not introduced as an adversary. Zi-O: Wow, this was a superlative episode. The character interplay was terrific, with Sougo, Geiz, and the two Wozes coming to a new understanding. 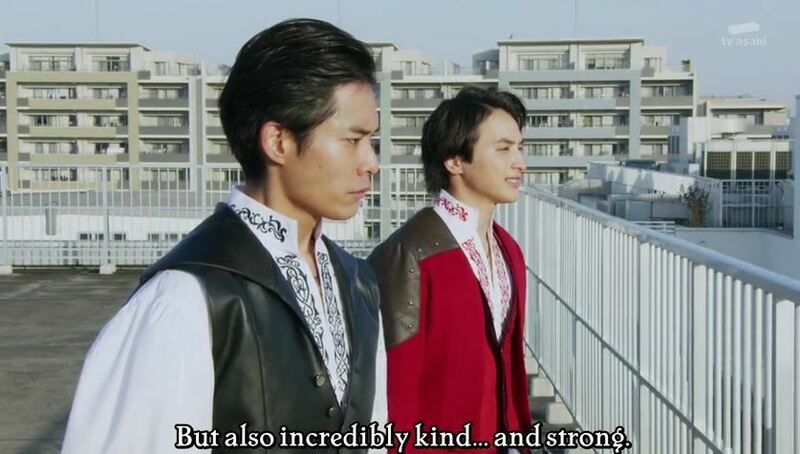 I love seeing Sougo being so cheerfully encouraging toward his enemy -- he's a weird guy with his eternal optimism, but he kind of reminds me of Gentaro/Fourze and his desire to befriend everyone, especially his foes. Nice visual composition of the scene between Sougo and White Woz on the steps, too. It's also a nice idea to bring final closure to the unresolved status quo at the end of Blade -- to finally avert the Undead apocalypse instead of just putting it eternally on hold. They also finally resolved Amane's pathetic little-girl obsession with Hajime and let her grow up enough to pursue her own life, which was nice to see. Although this show does have a tendency to gloss over the worldbuilding elements that make it hard to reconcile the Phase I series into a common universe. Back in the Faiz tribute episode, they managed to bring back Takumi and Masato and their mutual hatred without saying one single word about Orphenochs, whose emerging existence and its likely transformation of the future of humanity was a driving factor in that season but immensely hard to reconcile with later seasons. Here, they do acknowledge the Jokers, mention the "Battle Fight" (yes, they actually called it that), and depict the Stone of Sealing, but they never mention the larger Blade mythology that those connect to, the battle of the Undead monsters for control of the Earth by the species they represent, and the previous battle that the Human Undead won 10,000 years ago. By contrast, it looks like the next episode will be mentioning some of the larger Agito mythology at least peripherally. That's another season about a whole new race of humans emerging, the Agitos, which also makes it hard to reconcile with other seasons. I wonder how they'll deal with the Worms when they get to Kabuto, or the Fangires when they get to Kiva. An integrated Kamen Rider continuity would be littered with multiple nonhuman races living among us. The CGI recreation of the Stone of Sealing wasn't quite right. In Blade, it appeared as a flat slab that was twisted smoothly around its center, one continuous piece, and it sometimes straightened out into a flat slab like the 2001 Monolith when it was activated. In this version, there's a sharp discontinuity between the flat portions and the twisted center. So there are six remaining powers -- Agito, Hibiki, Kabuto, Den-O, Kiva, and Drive (with the Ridewatches highlighted in chronological order). I guess that means they're counting the acquisition of the Kuuga and W Ridewatches in the movie, although we've only seen Sougo use the latter in the show. But Geiz already has the Drive Ridewatch, which he stole from Oma Zi-O along with the Ghost Ridewatch before the series began. Still, I'd be glad to see a Drive reunion episode, especially if they get Shinnosuke/Drive himself to appear. Ryoma Takeuchi was one of my favorite KR lead actors. Interesting that Hibiki through Kiva are consecutive, the 6th-9th Heisei seasons. I wonder why they left that block alone until so late. Agito was the 2nd and Drive the 16th. So far, the order of the revisits has been: 20 (Zi-O itself), 19, 18, 13, 4, 14, 12, 15, 17, 10, 3, and 5, with 1 & 11 only touched on in the movie. rinity Form? I swear I've seen that before... but maybe I'm just Imagining things. Trinity for is even formed similarly to Climax. Oh, I see what you mean. Yeah, it's a similar approach with the "faces" on the shoulders and chest actually seeming to have lives of their own. Ryuusoulger: A pretty good one, with some fun character work and effective humor. I loved the "duel" between Red and Green, and the way they figured out the monster's psychology and how to use that to fight it. Tying the monsters in to human drives adds a nice new element (although, again, it's one often seen in Kamen Rider). The bit where Kureon (Creon?) figures out how to use Red & Green's competition against them is nice too. Still not crazy about the LEGO-style RyuuseiOh variations. "I've got a green tiger's hindquarters dangling off my arm! Fear my power!" Plus, why do they insist on lumping Pleistocene mammals in with dinosaurs in these things? Meltatron? Hasbro, your Transformers are showing. An evil Beet J Stag will be interesting or he could be like Vision from Marvel. He's built for evil but the rangers are able to capture him to be used for good. Oh yeah, I caught that. I thought they got the NASADA acronym from Megaranger stock footage or something, but the RangerWiki doesn't say anything about it (the organization there was INET). It was really nice to see the agito cast. Shouichi reemerging in the shadows was pretty cool. I can't believe we've known/heard of Rina Akiyama/ Mana in Agito since 2001. From young teen to Kamen rider Den-O to now. She looked a little more thin this time around. They gave Tsukuyomi something to do! Her name is code name? Seems like a bit late. We've still got Rider tributes and Zi-O's story to get through and fit in. Having Another Agito, as the only preexisting Another Rider, be dealt with by more than just Team Zi-O for once was a great idea. So would Another Agito's Another rider be Another Another Agito? We got a MotW that didn't grow large because Tankjou was the main giant fight of the episode, even if Milneedle didn't exactly kill him. The thing i'm noticing about this season is that they're trying to make it look like no one is safe. It's fitting that they'd use this story to reveal Tsukuyomi's amnesia backstory, since Shouichi had amnesia for most of Agito. Another Agito having the power to create more Another Agitos zombie-style is an interesting twist on the original idea that Agitos were potentially a new race of supernaturally powered beings, sort of like mutants in Marvel, rather than just a single individual. Aside from maybe his cameo appearance in the Decade movie, I think this is the first time we've seen Shouichi Tsugami addressed as "Kamen Rider Agito" instead of just Agito. They never used the term "Kamen Rider" in-series on his show; the beings with Agito powers were just called Agitos, and even G3 was called an "honorary Agito." Let's see... In Heisei Phase 1, I think the only ones that used the term "Kamen Rider" in-story were Ryuki, Blade, Den-O, and Decade. Kabuto called them by the English translation, Masked Riders (in that the two main forms were Masked Form and Rider Form). Hibiki called them Oni. Kuuga and Agito, and I think 555 and Kiva, just referred to the Riders by their individual designations with no blanket term for them as a class. In Phase 2, by contrast, the only ones that didn't use "Kamen Rider" in-story were Wizard (which called them Mahoutsukai/Mages) and Gaim (Armored Riders, halfway there), although both Wizard and Gaim did get called Kamen Riders in their pre-series crossover debuts with their predecessors. Introducing him with his sound effect, having his face obscured by the shadows and his belt light, and having him transform without a "Henshin!" call are evocative of his debut appearance, IIRC. I wonder if she'll be back as Naomi in the Den-O episodes, and if they'll remark on the resemblance. I didn't recognize him as the actual "Another Agito" from the old show -- the recycled suit with the usual name/time stamps added on. Of course, that was "Another" in a different sense -- just another one of the various potential Agitos whose power had grown enough to let him transform. And I don't think he was overtly called "Another Agito" in-story, just behind the scenes and in the merchandise. Although I notice they've already started streamlining that weird "tribal dance" henshin sequence here, which is probably for the best. Speaking of dancing, it was tonal whiplash to go from Banba screaming at his brother's apparent death to "Let's do the happy dance!" Meanwhile, sometimes when I watch Kamen Rider and Super Sentai, I can't help wondering... how the heck do they get up onto all those roofs in order to have dialogue scenes while staring out at the scenic cityscape? Aren't they trespassing? I rarely spend any time on the roof of anything (unless you count the university plaza that has a building underneath it), but these characters do it all the time. This roof is infamous. They love to do photo shoots of characters. Some at the time aren't even revealed yet! 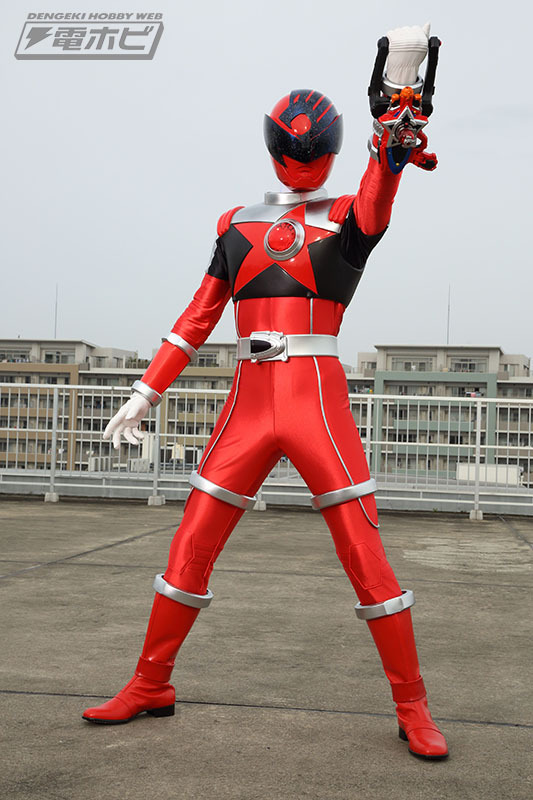 One day you're doing your laundry and the next super sentai red is across the roof having a phootshoot. Yeah, the real-world reasons are obvious. I'm talking about in-story. How do these guys keep getting up on the roofs of these random buildings? Why do they even want to? Okay, here I guess Banba wanted the vantage point to use his super-vision RyuSoul, but so many other times it just seems gratuitous. The Timejackers in Zi-O hang out on roofs and ledges all the time, and there was that one where Geiz was randomly standing on the edge of a roof, a Timejacker forced him off of it, and Woz saved him. Then there's the huge amount of time they spend filming in and around Ajinomoto Stadium, especially in Kamen Rider. I keep seeing these scenes where two characters are randomly meeting or having a conversation in the stands of the empty stadium, and I keep wondering, "Why, in-story, are they even there?" was mind blown when I found out that most of the Power Ranger footage was from Japanese TV series that run since decades! I remember back when MMPR season 2 was first on, I was pleased by how much more original footage they were shooting and I thought it would be nice if they stopped recycling Japanese footage altogether and did a fully original show. Now I'm much more familiar with Super Sentai and I generally prefer the originals to the adaptations. Interesting how some Japanese folks interviewed in the article are complaining about the country's adherence to imperial eras and advocating a final move to the Gregorian calendar everyone else uses. I guess I've gotten used to shows like Kamen Rider and Super Sentai using both Gregorian and Showa/Heisei dates interchangeably -- I didn't realize this was seen as a problem. And if they give up using era names, then how will future tokusatsu shows and kaiju movies differentiate their production phases? ?